If you only read this one sentence you will at least get the point that more protein is needed for older active adults to build and maintain muscle for the best of health. Two weeks ago at one of our Chiropractic Conventions I ran into Dr. Catherine from Burtchville MI. We had a good conversation about protein needs for older adults and the inconsistent information available. Older and especially active folks need more protein than their younger counterparts, period. Sometime ago, that may have been considered controversial, but now many experts consider it a fact. I recall reading that a high protein intake resulted in bone loss and put a strain on the kidneys, both are risky for older people. Now it’s been shown that more protein is a benefit for bone health, and getting enough protein is as important as getting enough calcium and vitamin D-3. Higher protein intakes, of up to 35% of daily calories, could be a risk to older people only when they already suffer from some type of kidney function problem. Now the best news is that after age 50, if you get enough high-quality protein (click here) in the diet, along with physical activity, can help overcome muscle loss and promote muscle gain. However, research shows that for people who are inactive, muscle loss can begin much earlier in age. And, inactivity along with low protein intake, means continued muscle loss with age is a sure thing. 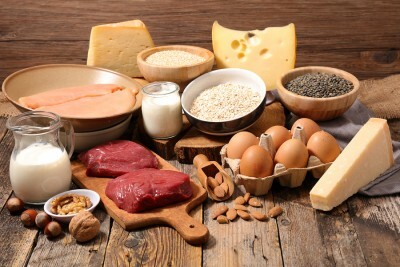 Protein is a nutrient that the body needs to grow and maintain itself. Next to water, protein is the most plentiful substance in our bodies. Just about everyone knows that muscles are made of protein. Actually, every single cell in the body has some protein. In addition, other important parts of the body like hair, skin, eyes, and body organs are all made from protein. Many substances that control body functions, such as enzymes and hormones, also are made from protein. Other important functions of protein include forming blood cells and making antibodies to protect us from illness and infections. Seniors who suffer from osteoporosis, cancer and an impaired immune system could benefit from taking whey protein supplements, says the University of Michigan Health System. Whey could help support cancer treatment, as well as treat cataracts, diabetes and viral hepatitis, notes the University of Pittsburgh Medical Center. Elderly individuals who have impaired mental function could experience improvements from taking whey protein. If you combine resistance exercise, such as lifting weights, push-ups or doing planks getting proper protein intakes appear to protect muscle and strength, even during weight loss. Whey Protein Isolate has the most essential amino acid leucine to promote muscle tissue synthesis. Research shows that protein requirements increase with age. Recommendations for how much protein is enough for older people vary, but it is suggested that most people over age 65 should take in about 1 g to 1.3 g of protein/kg of body weight per day to both gain and maintain muscle mass and function. There are no separate recommendations for people between ages 50 and 65, but getting enough protein during that time would make good nutrition sense. Note: Exercise increases the efficiency of muscle protein synthesis in older adults. Older vegetarians can achieve a higher recommended protein intake, but it requires more planning. Vegetarians should get protein from soy products, such as tofu, soymilk, and soy yogurt; lentils; beans; nuts; and seeds. Amazing things happen when we give our body what it needs. And not so amazing things happen when we don’t.